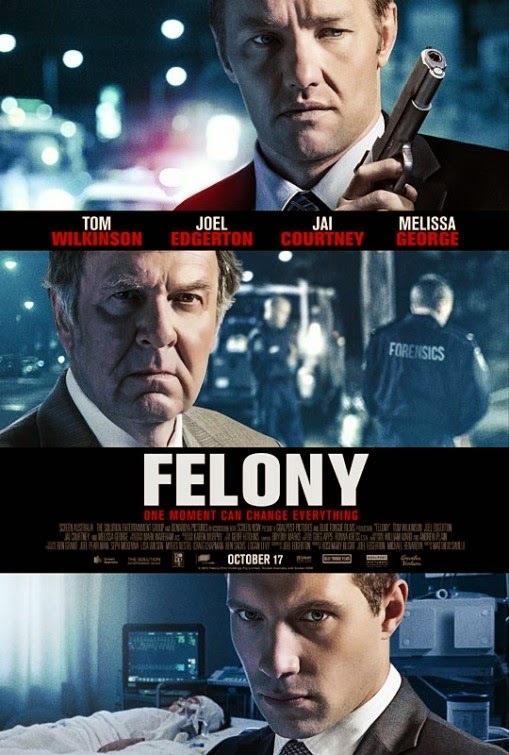 Our sympathies are with Detective Mal Toohey (Joel Edgerton) right off the bat in FELONY, an Australian drama Edgerton also wrote the screenplay for. While chasing a suspect in the film's opening scene, Toohey takes a shot in the stomach. Fortunately he's wearing his bullet proof vest, but he was putting his life on the line for his job nonetheless. While celebrating his survival and a successful bust, Mal has a bit too much to drink. He's a cop, so he gets a pass at a sobriety checkpoint, and besides, he's not really that drunk, right? Drunk enough to sideswipe a 9 year old boy out riding his bike, it turns out. To his credit, Mal calls the accident in and stays with the victim as paramedics and police arrive. But when giving his story of what happened, Mal bends the truth more than a little. At this point, it's safe to say our feelings towards Mal are a little more conflicted. Joining the uniformed officers at the scene are a couple of detectives: Corrupt veteran Carl Summer (Tom Wilkinson), and his straight arrow partner Jim Melic (Jai Courtney). Summer has a fair idea what really happened and does his best to cover for Mal. Jim, however, keeps digging into the case, much to his partner's chagrin. As for Mal, he seems to be suffering a crisis of conscience, almost admitting his culpability to the victim's mother while visiting at the hospital where the boy lies comatose. From there, the film takes a number of turns, some expected, others surprising. Ultimately it's not just about Mal taking responsibility for his actions, but the difficulty of anyone making any kind of right choice. Edgerton seems to have an affinity for this kind of character, as evinced by his portrayal of a husband hiding another dark secret in 2012's WISH YOU WERE HERE. Wilkinson is his usual excellent self, and Courtney shows that he's far better than most of the roles Hollywood has given him to date. Although his background is primarily in Australian television, director Mathew Saville's style is understated but absolutely cinematic, packing as much tension into conversations as some directors do in big action scenes. It all adds up to one of the year's most engaging and morally complex dramas. 3 ½ out of 4 stars.